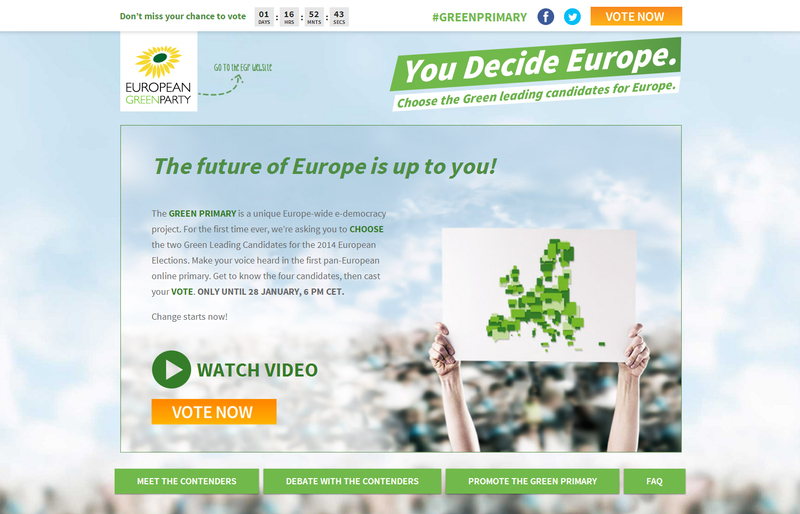 The European Green Party, which is a transnational political party consisting of 40 green parties from throughout the European Union, are asking you to choose the two green leading candidates for the upcoming European Elections which are held between 22 and 25 May this year. This is the first ever Europe-wide online election for a parliamentary group in the European parliament. José Bové, Monica Frassoni, Rebecca Harms and Ska Keller are the four contenders in the Green Primary and have participated in live-chats and debates in several European cities, such as Berlin, Prague and London. All four of them are green politicians from across the EU who want to represent the Greens on a European level in the European elections 2014. Before they become contenders of the Green Primary, they were nominated by their national Green party and their candidacy had to be supported by at least four Green parties from across the EU. In an effort to counteract declining trust in the EU, the European Greens wants to give people a stronger voice in European decision-making. And they see the Green Primary as a way to reinvigorate European democracy. Voting ends tomorrow (Janurary 28) at 18:00 CET. So if you are an EU citizen, over the age of 16, and you share “the values, goals and work of the European Green Party” you can help choose the two leading candidates for the European Green Party. To vote, just go to www.greenprimary.eu and register. You will need an email address and a mobile phone. You can also vote with your smartphone or tablet. The contender with the highest number of votes will be elected. The second winner will be the person with the next highest number of votes who is from another national list to ensure that the two leading candidates represent different parts of Europe. My political work began in 1975 in the German anti-nuclear movement. As Co-Chair of the Greens/EFA Group in the EU Parliament, I have always fought hard for our ideals and aims. The continuing dispute over energy transition and climate protection tells me that we Greens, being a relatively small party, need not just passion, but a lot of patience for our big ideas. This also applies to Europe. We want and we need to take new steps on the path towards political union. We need passion and patience to regain the trust of the people for this idea. In our European campaign, I want to speak out against shortsighted policies and campaign for sustainability, solidarity and a good quality of life. Learn more about Rebecca Harms. I grew up in the Eastern Bloc, but have lived Europe for as long as I can remember. Anti-racism and internationalism became guiding principles as I worked on cross-border solidarity in my home on the Polish border. Young Greens and Green Parties of Europe spoke to this in a way that never quietened, but still calls me today. For our shared environment, for a united Europe of peace and freedom, capable of facing social, economic and international challenges, for the things that hold us together. A Europe of solidarity of generations and regions; for all people, against austerity. With your support, I will campaign in all parts of Europe to convince people that now is the time to vote green. Learn more about Ska Keller. Member of the European Parliament since 2009, I am first of all, a farmer of the world. On the Larzac, where I milked sheep for years, I struggled to save my land against the army. From Seattle to Porto Alegre, with NGOs, I claimed that our world is not for sale! Since 1970, when my opposition to nuclear power started, my life has been guided by ecology. I fought GMO with civil disobedience and ended up in jail, but in the end, we secured their banning. Years of mobilisation forced the French government to ban fracking. With the Greens, I am ready to be one of the 2 leading candidates for 2014 for an ecological Europe, the only subversive dream which empowers citizens and protect our planet. Learn more about José Bové. To restore our self-confidence and have a positive influence on world affairs, we have to transform the next EP Elections into a real competition. We must do it noisily by stirring controversies and debates with the other parties, by mobilising our members and finding new support. We have to convince citizens that they have a say in EU affairs and that, unless they speak up, EU will split again. If they don't, we will not solve the crisis and our collective irrelevance will be inevitable. My decision to run in this Primary stems from an ambition to participate in a team with the other contenders to make our proposals visible and credible across the EU, well ahead of the EU elections. Learn more about Monica Frassoni.